I'll share the relevant strip here..
All this reference to light and dark in sides of the force creating it - and it having a purpose screamed Rey and Kylo/Ben to me!!! The Poe Dameron 21: Legend Found, part II comic was released Nov 2017. In it, this unidentified artifact is named- the Kazerath Device. And... we find out more about it. I'll share the relevant images.. 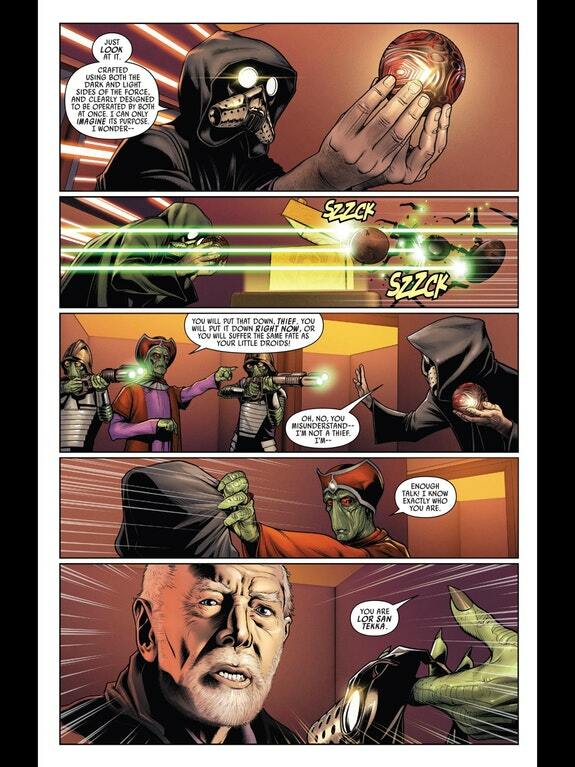 The context here is that Lor San Tekka was captured breaking into a vault to access the Karerath Device and is now on trial for theft.. he is defending himself and explaining why he came. The vault was in Cato Neimoida, in the 'House of Maccon' vault. 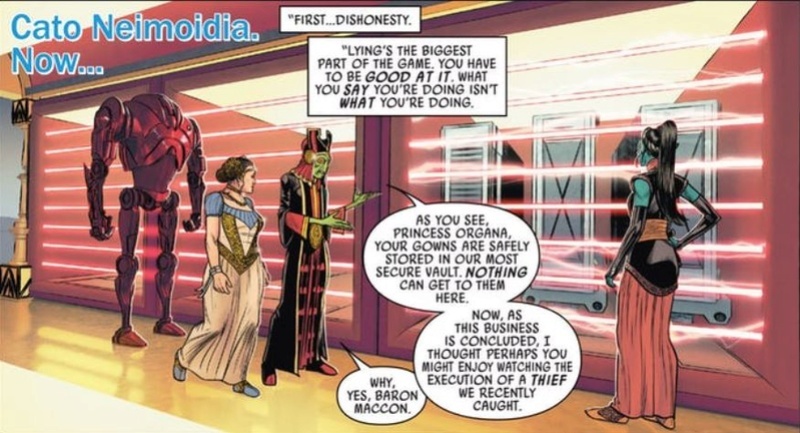 This is the same vault where Princess Leia (in this same issue) is seen to be storing her mother's wedding dress for her granddaughter one day. ahem... [I know that has been shared here already - but again I can't find it and acknowledge the person who shared it. sorry. let me know if you want me to share them again.]. The references to a time in history when light and dark were united, and to the 'future' and the end of the battle between dark and light have me super excited!!!!! It seems to go to great pains to give random exposition about the device - and how if only light and dark could work together. gah!!! 1) the device is incredibly unique. It might imply a chapter in the grand history of the force when light and dark were not in opposition, but united. I petitioned the device's owner repeatedly to be allowed access to the Kazerath, but no - he denied me. He prefers to keep it buried away in your vault rather than let me learn from it. If anything, that is the true crime here! 2) As you know, I have dedicated my life to gathering knowledge about the force. Both sides, light and dark. So many lives have been lost in their battle over the millennia -- but I think someday this fight could end. 3) If they could work together, see that in many ways they are the same... perhaps the Kazerath is a path to that future. I had to see it. And so yes, I did break into your vault. Thanks so much for sharing this. I was planning to read the Poe Dameron comics, so this has me pretty stoked, if this is to be all connected together. It’s not even subtle; it’s all there in color! I’m not a comics person, but I have to read these. Very interesting. I do feel that this is the general tone of the ST, the possibility of the Light and Dark working together. 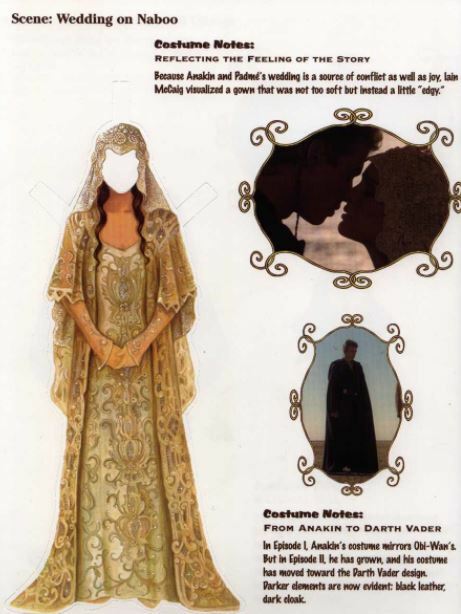 And I’m very intrigued to see the Leia bit with her mother’s wedding dress. I’ve seen it being mentioned, but haven’t seen the actual thing. Would be great if you could share it? Thanks! Some first order agents have stolen Padme's dresses already in the latest issue...though not on Kylo's orders. 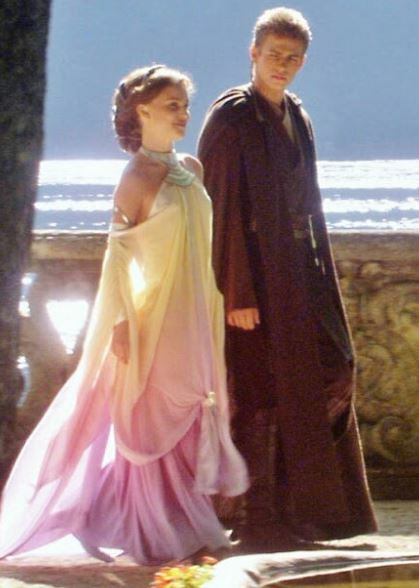 @panki wrote: Some first order agents have stolen Padme's dresses already in the latest issue...though not on Kylo's orders. Yo FO agents are good people, they know the supreme lady of their supreme leader will need these vintage dresses when she comes back to have a wedding with him. These are agents who probably plan to destroy it to get to Lor San Tekka. whooo the plot thickens! Thanks for the update! Have you read Poe Dameron 22 panki? I randomly searched re the artifact yesterday only to find this new info - and that it was actually yesterday that the 22 comic was released. I found a preview of it online but it's not on youtube yet. Here's the preview: https://screenrant.com/poe-dameron-22-leia-kazerath-device/ if anyone is interested.. If anyone comes across the full comic on youtube could they update us please? lol I don't usually have this much time for star wars. I'm on holidays! Anyway - so the FO now has it. How very interesting!!!!! So Kylo should be able to get his hands on it. Or who knows, maybe he already has it and we don't know it. The containers Leia stored looked quite massive.. I'm wondering what else was in them. Anyway, to bring this story thread back into things would be a lovely way to honour both Leia and Padme. 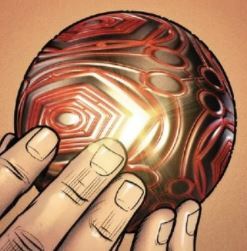 It's possible the Kazereth device is no longer stored where it was in the comics too.. we shall see! However, the idea of a star wars take on a heist sounds like loads of fun - especially dealing with all the defences these vaults seem to have in place.. It's interesting that Lor San Tekka was able to locate the Kazereth device.. he found information about it's existence, and he was able to track down it's current owner and write to 'him'. This means even with LST now dead (thanks for that Kylo- not! did you have to?!) if this is part of the story in IX, this thread of investigation will be able to be followed to the same conclusion I think. Where did we get the reference to the wedding dress? I initially said that but I think I'm wrong. 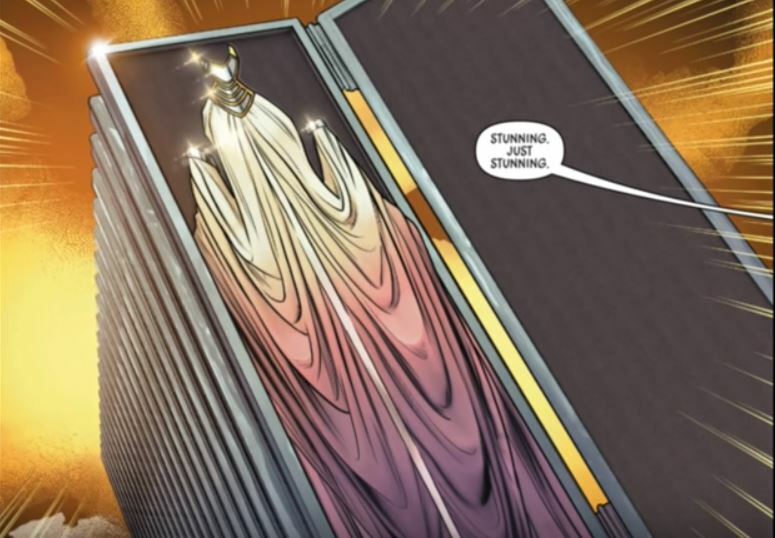 I can't see the comic identify any of the gowns as Padme's wedding dress - or does it? have I missed that? it seems the gowns are all stacked up.. maybe there is a wedding dress in there.. The Poe Dameron comic is truly the gift that keeps on giving. @ISeeAnIsland I think your headcanon where two Force users, one dark and one light, have to work together to achieve a common goal may come true after all!! @IoJovi wrote: The Poe Dameron comic is truly the gift that keeps on giving. @ISeeAnIsland I think your headcanon where two Force users, one dark and one light, have to work together to achieve a common goal may come true after all!! I hope so! 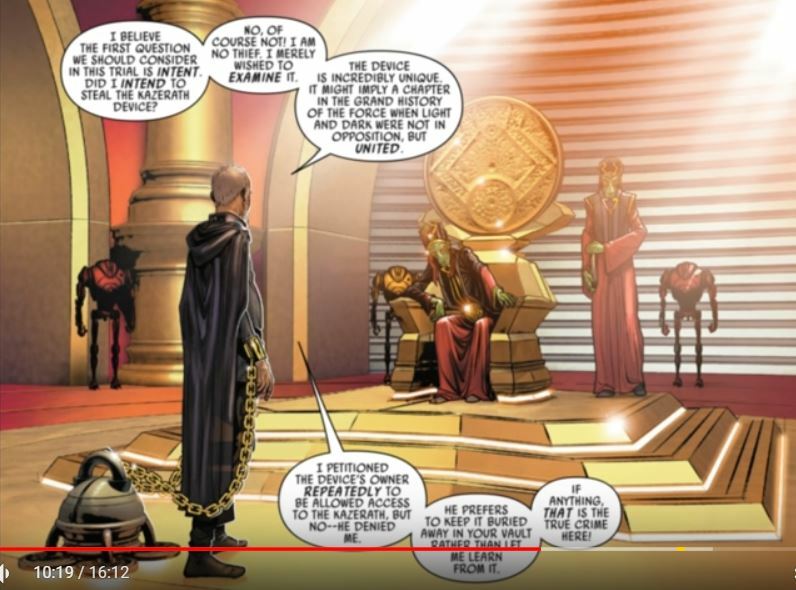 Granted, for all of the hints about artifacts in the new canon books, comics, etc,...there weren't any mentions of them in TLJ. 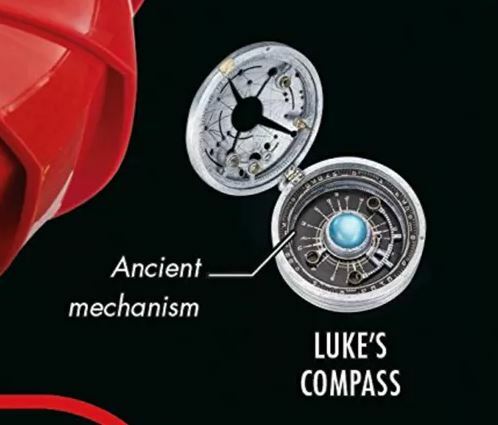 Heck, as far as I could tell, even Luke's compass (which we were so sure would turn out to be important) didn't make it in for anything more than a single shot, did it? 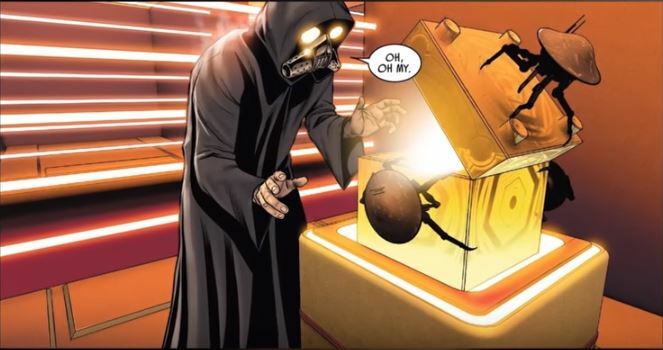 Poe was hidden in the box with the dresses....he pulled a Mission Impossible type escape from the vaults, rescued Lor San Tekka from the prison and hid him in the dress box in his stead. In the meantime BB-8 flew in with Poe's black x-wing for their escape. Leia pretended she didn't want her dresses stored in that vault and that she would look after them personally.....in the meantime, two FO agents killed Leia's pilots, shot BB-8 in the head and damaged his circuits... they then flew off with the dresses (and Lor San Tekka hidden inside) as well as Poe's X-wing and BB-8. The story stopped there for now. I wonder if this device is the something else that acts as a medium to bring balance to the force, which through some reading, not sure where, I think it's not so much dark and light, but power and love and the balance in that. thanks for sharing this idea Starliteprism. The story of the force is supposed have been inspired by eastern mysticism and various religions.. which I'm not across. So thanks for sharing this! It's related to the order of nature, strength and the mathematical power of the hexagon. Sounds a bit force like maybe? So many hexagons going on in SW - the first order and sith symbols used hexagons.. Circles or circular symbols were used by the jedi and republic.. and the circle is also viewed as related to spirituality.. with universal meanings related to nature..
Could the two symbols together united symbolise balance? In the Kazerath - we see both Hexagons and circles! As LST would say- I wonder what it's purpose could be? Of course, this could all mean absolutely nothing. could just be some confirmation bias tee hee... haaa but it's fun to ponder. Oh what a treat - thanks so much for sharing Panki! Ohhh I was wondering how LST could escape but not end up with Leia - I figured that must be the case or she wouldn't be sending Poe to meet him at the start of TFA. The plot thickens!! The FO may not destroy the dresses.. after all they were Vader's wife's! They may view them as sacred..
Just putting this here for future reference.. if this even means anything! The blue stone in the centre is: 'Supraluminite lodestone. Attuned to hyperspace vectors' hmmm.. lol means nothing at this point in time to me! maybe someone else can shed some light on this.. Here are the images for a good look at the interior..
@DeeBee wrote: Just putting this here for future reference.. if this even means anything! In The Last Jedi, the compass was scene twice, once with Luke when he was folding his clothes/robe and the other on Kylo Ren/Ben Solo's table at the jedi camp. The Compass was used by Luke to find Ahch-to. I think "hyperspace vectors" will end up referring to the special paths needed to get to the Unknown Regions. Over a year ago Pablo said that Ben and Luke were "working on something" when they were off together. He also said around the same time "that there is a lot more story to be told." We got how the Ben and Luke relationship broke down in TLJ. We have not gotten what they were doing. Also keep in mind that Snoke had those alien "attendants" who guide people to the UR. Now Kylo/Ben has access to those guys and to whatever information Snoke had because he is SL now and a studious bookish type to boot. Rey has the ancient Jedi books and access to Luke's stuff if she wants it. Wanna bet that Rey and Kylo/Ben follow the same line of inquiry and meet up on the same search. Yes, indeed. I do feel that they will be teaming up at a point. Any one else see those two specs in the sky just before Luke made his exit? My gut was it didn't look like birds, maybe ships, and then he let go. Of course, maybe the movie screen was dirty in that section. Will watch the film again next week. My son noticed that compass immediately when we saw the movie yesterday. He pointed it out to me. I had missed that compass the first time I saw the movie and if he didn't point it out to me I would never have noticed it. I’m so glad there are others interested in this stuff too! Whoa! Great eyes Starliteprism! I didn’t see it on Ben’s table.. that was a moment where I thought – gotta wait for the dvds to search that table at the jedi camp. @SoloSideCousin wrote: I think "hyperspace vectors" will end up referring to the special paths needed to get to the Unknown Regions. Over a year ago Pablo said that Ben and Luke were "working on something" when they were off together. He also said around the same time "that there is a lot more story to be told." We got how the Ben and Luke relationship broke down in TLJ. We have not gotten what they were doing. Also keep in mind that Snoke had those alien "attendants" who guide people to the UR. Now Kylo/Ben has access to those guys and to whatever information Snoke had because he is SL now and a studious bookish type to boot. Rey has the ancient Jedi books and access to Luke's stuff if she wants it. Wanna bet that Rey and Kylo/Ben follow the same line of inquiry and meet up on the same search. Yeah being renperor he has all kinds of access to force relics/artifacts the FO has acquired. Renperor could be instrumental in bringing balance after all.. I for one would love to see Rey and Ben teaming up to combine resources and knowledge and solve how to bring balance (I tend to lean toward it not just being intrinsic to the two of them existing). @birdwoman – go your son !!! have you shared info on the Kazerath device with him?! One final thought - the star compass may have led Luke to Ach-to. I don't think this has been confirmed.. but I also think this doesn't exclude the compass leading to other places of significance to the force either. I wish I could see clearly the script that seems to be around the outside of the dial there - it's not the same as the script on Snoke's ring is it? I can't see it clearly enough.. It could be that the Kazareth device needs to be operated in a specific location int eh universe by both the dark and the light.. the compass could lead to this location. If none of it comes to pass? I'll have enjoyed exploring ideas anyway. win win. That would be so awesome! I'm trying to not speculate too much/develop many headcanons after being so wrong about where TLJ was going, but getting Kylo and Rey to work together on some ancient Force quest would be a dream come true.